3d Man Coming Out From Shell PowerPoint Templates And PowerPoint Themes 0812-"Microsoft Powerpoint Templates and Background with man coming out from shell" Sharpen your strategy with our 3d Man Coming Out From Shell PowerPoint Templates And PowerPoint Themes 0812. You will come out on top. Our 3d Man Coming Out From Shell PowerPoint Templates And PowerPoint Themes 0812 get you a promotion. With our money back guarantee you have nothing to lose. 3D Man Coming Out From Shell People PowerPoint Templates And PowerPoint Themes 0812-"Microsoft Powerpoint Templates and Background with man coming out from shell" Display executive leadership with our 3d Man Coming Out From Shell People PowerPoint Templates And PowerPoint Themes 0812. They will make you look good. Deliver your address with great fervour. Our 3d Man Coming Out From Shell People PowerPoint Templates And PowerPoint Themes 0812 keep the enthusiasm at high pitch. 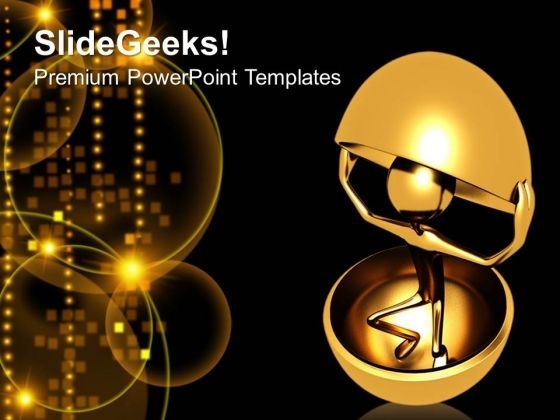 Create visually stunning and define your PPT Presentations in a unique and inspiring manner using our above template which contains a graphic of golden 3D man coming our from shell. This image represents the concept of protection and security. This image has been conceived to enable you to emphatically communicate your ideas in your Business PPT presentations. 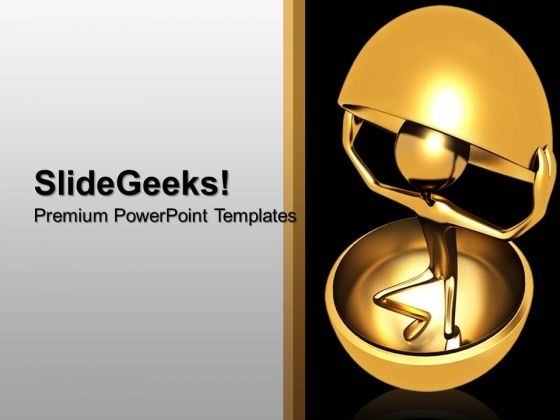 Get the advantage and add personality to your presentations with our stunning templates. Take all factors into account. Take a cue from our 3d Man Coming Out From Shell Metaphor PowerPoint Templates And PowerPoint Themes 1012. 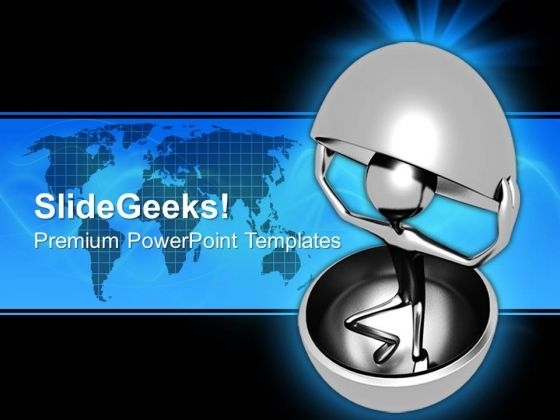 Clad your thoughts in our 3d Man Coming Out From Shell Metaphor PowerPoint Templates And PowerPoint Themes 1012. Dress them appropriately for the event. 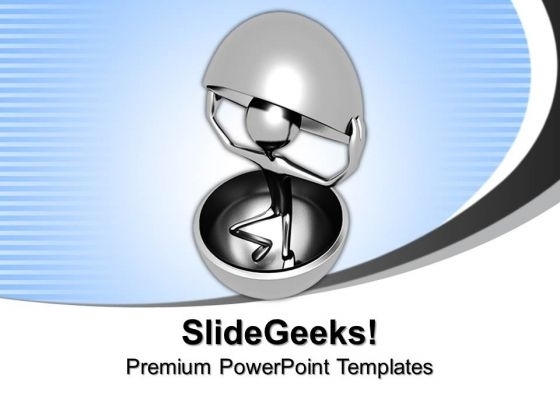 Deliver amazing Presentations with our above template which contains an image of 3d man coming out from shell. This image clearly defines the concept of security. It is a powerful tool concieved to enable you to define your message in your Business PPT presentations. Our PPT images are so ideally designed that it reveals the very basis of our PPT template to make your clients understand. Export your ideas to different shores. Ship them out on our 3d Man Coming Out From Shell PowerPoint Templates And PowerPoint Themes 1012. Stimulate peoples brain with our 3d Man Coming Out From Shell PowerPoint Templates And PowerPoint Themes 1012. Just download, type and present.